You know that blank stare you get when you try repeatedly to describe something to a young dancer and they don't understand? It can feel like you are speaking a different language... Perhaps because in a way, you are! -Understanding an auditory cue in a kinaesthetic way requires a translation across the senses; a dancer must take verbal feedback and turn it into a movement pattern. This process can be a real challenge for students and teachers alike. 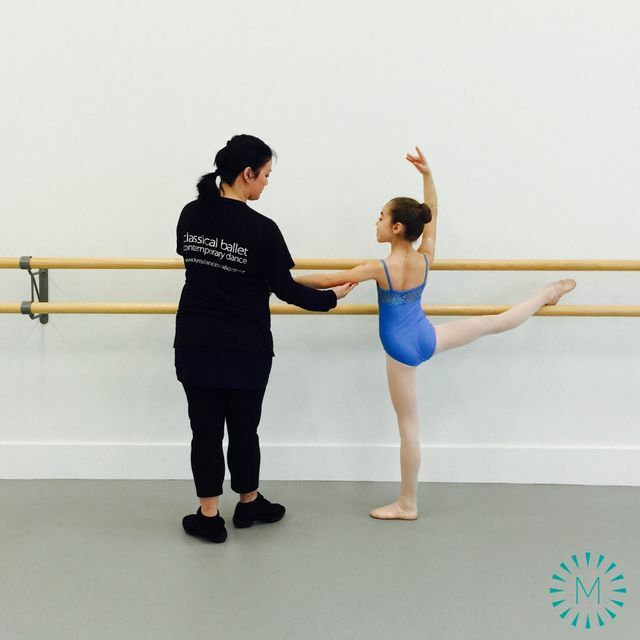 However, even slight changes to wording can make a huge difference to a dancer's understanding of how to execute a movement, and can make a big difference to their learning and understanding of dance. “Don’t lock your elbows.” I heard this correction over and over again as a student, but strangely, hyperextended elbows frustrated me well into my dance career. Jumps were another story, though. A coach once challenged me during a grand pas de chat to “try staying airborne until you absolutely have to come down.” Afterward, taking flight in big jumps became a favorite challenge." - TaraMarie Perri. As any mother of young children knows, distraction is a great tool to encourage a child to comply. Similarly, giving a correction whilst also directing dancers' attentions towards something else can work well. For example rather than "stand tall" or "lengthen your spine" instead try, "while you keep your spine lengthened, you are going to..." or "while you are relaxing into this movement...". In this way dancers subconsciously respond to the first suggestion whilst focusing on the second. It can be irritating to be told to try... and sometimes a dancer is trying but the teacher needs more or wants them to try in a different way. Statements such as "try to press your heels into the floor" will have them replying (or thinking!) "I am trying!!". Instead comments like "good now keep pressing your heels into the floor.." or "nice but keep lengthening" and "don’t forget to keep engaging your tummy" can help dancers who get frustrated at being told to 'try'. Similarly it is important to remember to give dancers corrections that they can translate into an improvement, this great link outlines the importance of helping dancers understand corrections. To get dancers on board try using hypnotic suggestion. For example, "is this useful? ", "are you learning something here?". Or similarly, "I thought we would do this, how do you feel about that, good?.. ", "we’ll do this now – ok?". - Try to get get the dancer nodding and agreeing, once you have a 'yes' they won't want to disagree with themselves - (this comes from experiencing 'cognitive dissonance' in case you are interested); additionally dancers tend to respond well if they feel involved in the process of the class. Similarly the affirmative question is super useful as teaching tool. This means asking students a question, for example, "dancers, would you like to come into the centre now?" but saying it as a statement. The question format softens the command and is really helpful to draw in students that are disengaging, by encouraging them to get involved and make an active decision to participate in the class. We all learn differently of course and prefer different styles of learning. It may be that it is helpful to supplement verbal cues with tactile or visual cues. Tactile cues - can be effective although of course have to be approached with caution. A muscle that is touched or palpated will tend to activate so remember to only touch the muscle that you want to activate. Remember also if it is not appropriate to use tactile cues that a teacher can cue a student to palpate themselves and this is very effective; palpating and feeling a muscle that should be working (such as the psoas prior to a developpé) can help dancers have that 'aha!' moment. Visual cues - Pictures as you know, tell a thousand words and activate our super helpful mirror neurons helping a dancer recreate the image. Visual cues such as photos of other dancers, pictures that encourage useful imagery and demonstration, can be really helpful. But, don’t forget to use video feedback of the dancer themselves -this is particularly powerful when the teacher directs a students attention to what they should be attending to in the video (1). Teachers, do feedback to us any of your own thoughts and suggestions -we would love to hear them!